If you’ve ever experienced the glorious churches in Europe — an organ concert in Paris, a carillon in London, a choir in Stuttgart, a worship service in Rome — you know the tradition of the music ministry at Idlewild Presbyterian Church. Our magnificent sanctuary pipe organ and our 48-bell carillon rising 120 feet over Midtown are a joy. Idlewild Presbyterian Church houses two magnificent musical instruments: The Sanctuary pipe organ, built by the Bedient Pipe Organ Co. in 1989, and the 48-bell carillon. 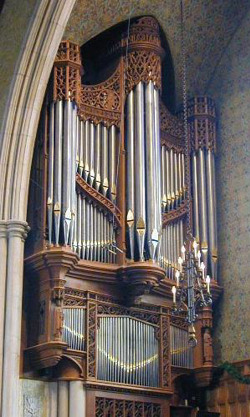 The design of Idlewild's sanctuary pipe organ was inspired by instruments of 18th and 19th century France. It is composed of three keyboards and a pedalboard. The 69 sets of pipes in the organ are combined into 47 individual sounds or stops and total 3,459 individual pipes. The key action system and stop action system allows the organist to create a large variety of combination of sounds and tonal colors. The console employs a memory system that permits the organist to store many different combinations of sounds. The local chapter of American Guild of Organists schedules meetings and recitals at Idlewild, in addition to recitals by the church’s organists. Idlewild's carillon of 48 bells was completed in 1999. The carillon is the only one in Memphis, and the largest musical instrument in the Mid-South. The bells, housed in a stone tower which rises majestically 120 feet above the church’s sanctuary, were cast at the Paccard-Fonderie de Cloches of Annecy, France. They range in weight from 4,397 to 29 pounds, totaling more than 26,890 pounds. Forty-four of the bells are stationary; the other four, the C, F, G and A in the bottom octave, swing in a peal or a random ringing. 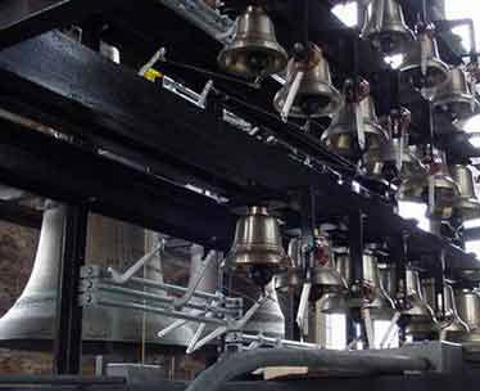 Due to the varying sizes of the bells, the smallest of the four bells rings first, the next largest follows, and so on. The cessation of the peal is in reverse order. The church building itself was completed in the late 1920s, but, because of the volatile economic times, the magnificent bell tower remained empty for decades. In 1980 the first 23 bells were installed, and the remaining 25 were installed in the fall of 1999. The full carillon was initiated by carillonneur Paul Hicks on December 31, 1999 at 11:59 as a welcome to the third millennium. Carillonneurs David Caudill and Peggy McClure give carillon concerts several times a year, in addition to playing for 20-30 minutes each weekday at 4:00 p.m.